Came for our honeymoon and loved every minute of it! The cabin is beautiful and the location is great! Will definitely be back soon! Highly recommend the Helicopter Ride! This is our second time staying with this company. Both times, cabins were very clean, easy check in and check outs. We thoroughly enjoyed our stay. We will be back! Though we've spent many fall days in the Smokies, this was our first time staying at this cabin. It won't be our last. 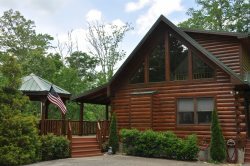 This cabins location is perfectly situated between GSMP and the Fontana Dam/Tail of the Dragon areas. We look forward to another stay! Beautiful cabin!! Loved our short stay. Rode the Great Smoky Mountain Train and did the Moonshine excursion. Hiked out at Deep Creek. Relaxed at the cabin. Thank you for opening your home to us. Would love to come back some day. The cabin was wonderful and the view is excellent at this cabin. The cabin was very clean. We enjoyed our vacation in Bryson City. We highly recommend. All I can say is thank you! The cabin was perfect! The office staff was amazing! The cabin is perfect in so many ways. Very quiet and private. Loved the Hot Tub and the big windows. We went to see Elk in Cataloochee, hiked in Deep Creek and relaxed. We had beautiful weather. What a beautiful place. We enjoyed our short stay. Enjoyed the creek and the ducks. We would love to stay again when we have more time. This is our third time here. We had a great time. Always a pleasure. Thank you for sharing your mountain home. We have enjoyed our stay here and appreciate the attention to detail - especially the beautiful dishes and dcor. The comfortable family room furniture was plenty for all four couples to enjoy a special time together. We will definitely consider visiting Bruins Den again the next time we are on our motorcycle trip to the mountains near Bryson City. Our visit this year was perfect. Cabin was close to everything, and it was an awesome stay. Very clean and overall a wonderful place for a relaxing and secluded getaway. We really enjoyed the deck and hot tub area. My husband and I were here for a fall getaway. The cabin is just beautiful as well as comfortable. It's very convenient to the towns to get out and sight see. I would like to return with our adult children. Thanks for sharing your gorgeous hone. We came to spend time with family and share new experiences with our grandsons. This cabin is cozy, comfortable, beautiful decor and efficient. We found it very clean and well supplied. We loved the seclusion and outdoor setup. We give it 5 stars! - Thank you! Cabin was perfect! So close to everything in town and the amazing waterfalls just up the road. Really enjoyed our stay. Oh, what a delightful surprise! We were tent camping and decided we would get a place for a few days when the cold came. What we got was a magnificent view, wonderful lodging - hating to leave! Loved the Hot Tub. Thank you so much! My husband and I were here for a fall getaway. The cabin is just beautiful as well as comfortable. It's very convenient to the towns in the community to get out and sight see. I would love to return with our adult children. Thanks for sharing your gorgeous home. We had a great time! Love the views! Love the cabin! The drive up the mountain is definitely worth it. Can't wait to come back! The staff handles all of our questions in a friendly manner. Excellent accommodations for our party of 4 motorcyclists. The cabin was very spacious, nicely done and furnished. Had a large garage available to us. We went riding all around the area, our annual event.